For people in Adelaide Metropolitan, Mount Lofty Ranges, West Coast, Lower Eyre Peninsula, Yorke Peninsula, Flinders, Mid North, Kangaroo Island, Murraylands, Upper South East, Lower South East and parts of Eastern Eyre Peninsula and Riverland districts. Issued at 4:07 pm Friday, 14 September 2018. Damaging winds associated with a vigorous west to southwesterly airstream, squally showers and thunderstorms. A cold front will move over central and eastern districts this evening. In the wake of this front, a cold and vigorous west to southwesterly airstream will develop over the south of the State bringing squally showers, small hail and isolated thunderstorms. 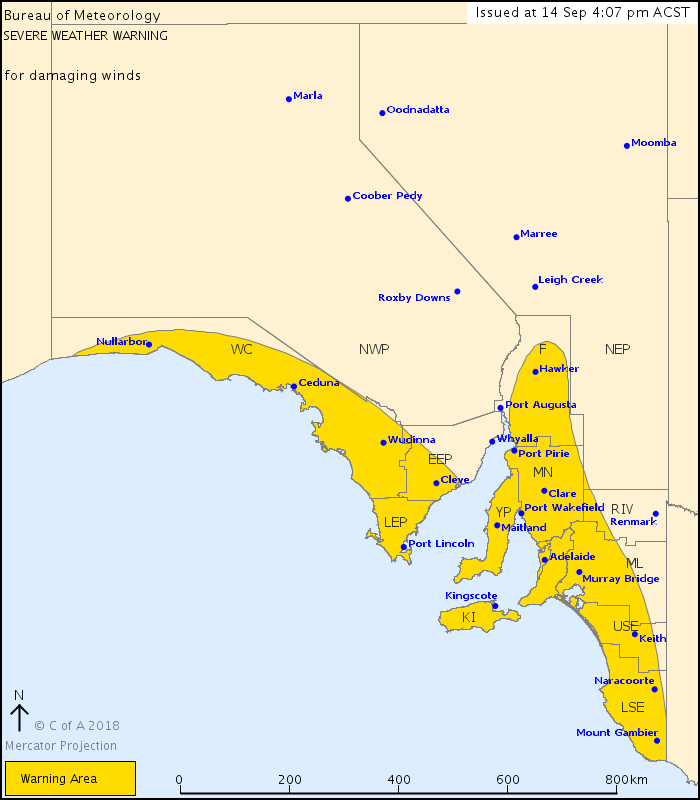 Potentially damaging winds averaging 50-65 km/h will first develop about far western coasts from early this evening before affecting remaining exposed coasts and higher ground of the ranges during the late evening and early Saturday morning. Damaging wind gusts generally in the range 90-100 km/h may occur over parts of the warning area south of about Clare, most likely with squally showers and isolated thunderstorms. For Adelaide, the onset of potentially damaging winds gusts is expected to be after midnight and continue through to around sunrise Saturday. However, gusty showers are expected to continue through the morning and afternoon. Locations which may be affected include Ceduna, Port Lincoln, Kingscote, Adelaide and Mount Gambier.